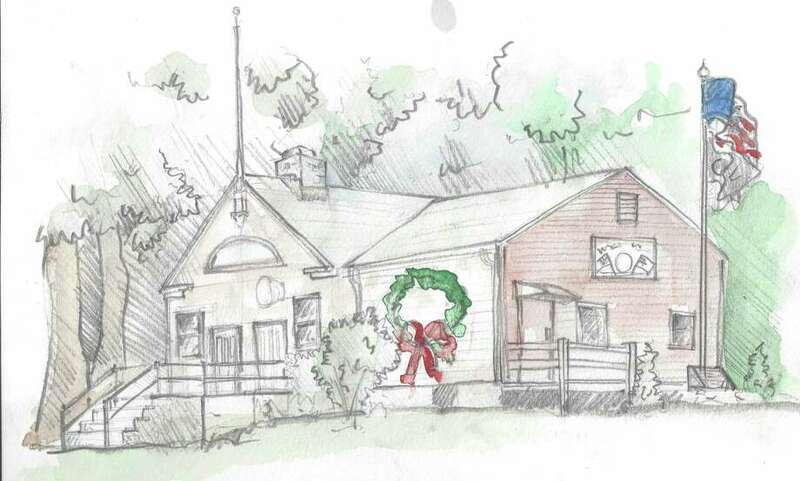 A sketch of American Legion Post 143 on Stratfield Road by Will Jameson. FAIRFIELD — When Liz Kohm found receipts in her attic dating back to the 1800s and a 1918 newspaper in her basement, she decided to research more about the history of her Stratfield house. From the documents and inventories she researched, Kohm was able to find out more about the history of the houses in the area. Throughout the years, her work along with others at the Stratfield Village Association, came to fruition with the first holiday house tour. “This is the first year that we’re running the Stratfield Village Holiday House Tour, and we’re hoping it becomes an annual event,” Meghan Ward, who is co-chairing the tour with Kohm, said. “When you buy a ticket (you) will receive a receipt which you will bring to the American Legion building at Owen Fish Park on Dec. 8 where you will receive your tour booklet which will include a list of the houses and a map for you to follow,” the website reads. The tour is aimed to help residents and interested parties learn more about homes in the Stratfield area, particularly their aesthetics and history. Proceeds from the tour will help support community-building efforts, including beautification, activities and historical preservation. As for ongoing research, Kohm said she’s still scouring databases and historical archives for more information. “I’m still researching more about my house, it’s led me down so many different paths and I’m not done,” Kohm assured.